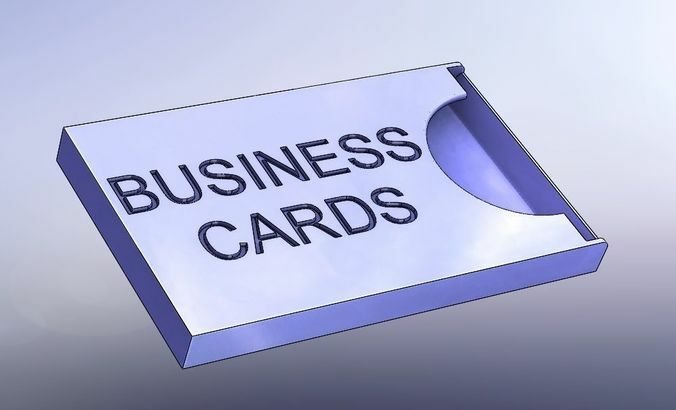 File: Business Card Holder.stl Name: Business Card Holder PLA Material: 29.01 grams ( 0.064 lbs) Infill = 10% Size: 50.8 mm (2) x 8.89 mm (.35) x 97.4 mm (3.835) Resolution: 0.20mm Layers: 493 layers Rafts: Yes Supports: No Print Time: 3 hr 4 min Function: A business card holder that holds 5mm (0.2) thickness of business cards. There is a thumb area to slide the top card out of the holder. This holder should be printed 1:1.